What's a mama to do when it's 30 degrees and you've got dessert on the mind? Make freezer fudge, of course! This awesome recipe is done in a snap & will fix those chocolate cravings, no oven in sight. 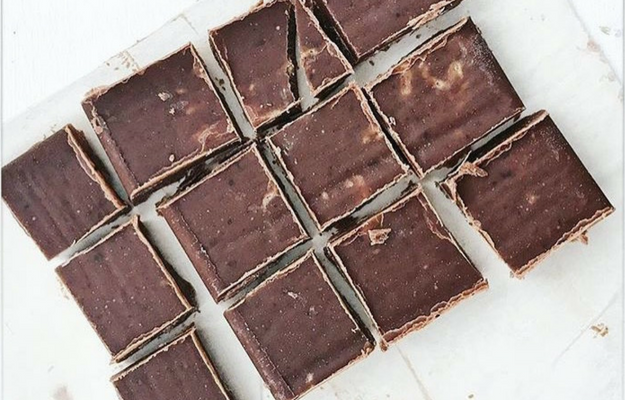 From Holistic Nutritionist & BB mama Michelle Tirmandi, here's a super simple way to kill those chocolate cravings without any "I just slammed a family pack of peanut M & Ms" regrets. The thing is, when you make homemade treats like this delicious, chocolatey almond butter freezer fudge, you naturally tend to stop yourself before you get to the lying on the couch, thinking about your life, post-binge haze. Factory treats, like those peanut M&Ms, are so processed that your body doesn't "read" them like regular, whole foods. That means YOU have a much harder time stopping. It's not willpower. It's science! When you're trying to limit your sugar intake, trying to lose fat, trying to eliminate processed foods from your diet, or just trying to set a good example for your kiddos, finding delicious, healthful substitutions for your "trigger foods" is a life hack every mama should try. In my private coaching with mamas & mamas-to-be, we call these foods "yellow light foods." It's not kale, people. You can't eat fudge for breakfast, lunch and dinner, but you can have it in the freezer and control your intake. Most of the time. Of course, there are moments of stress where I've been known to go head-first into a box of cereal if that's the only thing around... but most of the time, a homemade treat packed with protein, fat and real whole foods texture will satisfy you and help your brain to know when it's full. Compare that to a "red light food" like processed peanut M&Ms, potato chips, cookies, or whatever your personal triggers might be. Subbing in a "yellow light food" like this delish fudge, a homemade muffin, an energy bite, or some pistachios or pretzels for you salty lovers, can help you to get the "treat yoself" vibe and resist the foods you truly can't control yourself around. So, throw a batch of this fudge in the freezer this weekend and yellow light it up! It's also a great potluck or BBQ recipe to share with friends and family. Happy long weekend! 4 ingredients & into the freezer. Bye, bye nighttime chocolate cravings! Line a small loaf pan with parchment paper. Over low heat, melt coconut oil in a small saucepan. Add remaining ingredients & melt together, stirring to combine well. Pour immediately into lined pan. Freeze 30 minutes. Remove once hardened to cut into small squares. find raw cacao nibs in the natural health &/or organics section of most grocery stores; it's packed with antioxidants and great in smoothies, on oats, or in baked goods!